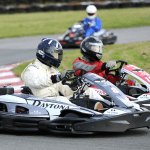 Our Open Races at Daytona Sandown Park allow racers aged 14 years and above of all abilities to compete against other individuals, groups or teams. All our Open Events are held on our full, 900 metre Grand Prix circuit. Whichever you decide to enter, you can be sure of healthy competition and adrenalin-pumping action. Please note that all Open Races require pre-booking and payment in advance.Book online or call us on 033 033 27870 for further information. Anyone aged 14 and over can race in our Sodi Open Races. Drivers aged 14 or 15 must be accompanied by an adult. SODI SPRINT – INDIVIDUAL DRIVERS Great for less experienced drivers and those looking to progress to a D40 Open. Each driver would enjoy a 10 minute practice in which they would attempt to clinch Pole Position by setting the fastest lap time. This qualifier would determine the grid for a 20 minute race, and at the green light drivers sprint to the finish. 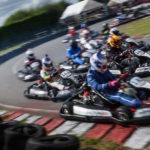 SODI CUP – INDIVIDUAL DRIVERS Great for less experienced drivers and those looking to progress to a D40 Open. Each driver would enjoy a 10 minute practice in which they would attempt to clinch Pole Position by setting the fastest lap time. This qualifier would determine the grid for a 30 minute race, and at the green light drivers sprint to the finish. SODI D40 – INDIVIDUAL DRIVERS Our most popular race format is a real test of skill and concentration. Each driver would enjoy a 10 minute practice in which they would attempt to clinch Pole Position by setting the fastest lap time. This qualifier would determine the grid for a 40 minute race, and at the green light drivers race non-stop in a sprint to the finish. SODI D60 CHAMPS – INDIVIDUAL DRIVERS (SUNDAYS) This is Championship Series for individual drivers consisting of a 10 minute practice/qualifying session followed by a 60 minute race to the chequered flag. Up to 30 drivers racing at the same time. Although this is a Championship series, drivers are welcome to enter these races on a non-championship basis.